Stephen William Hawking (1942-2018), Theoretical Physicist. Sitter in 11 portraits. Yolanda Sonnabend (1935-2015), Theatrical designer and painter. Artist of 9 portraits, Sitter in 3 portraits. In the 1980s, encouraged by Margaret Gowing (who was both a Trustee and an historian of science), the Gallery embarked on an active policy of commissioning portraits of scientists, on the grounds that science and technology make a contribution to British culture which is not always well understood by the general public. 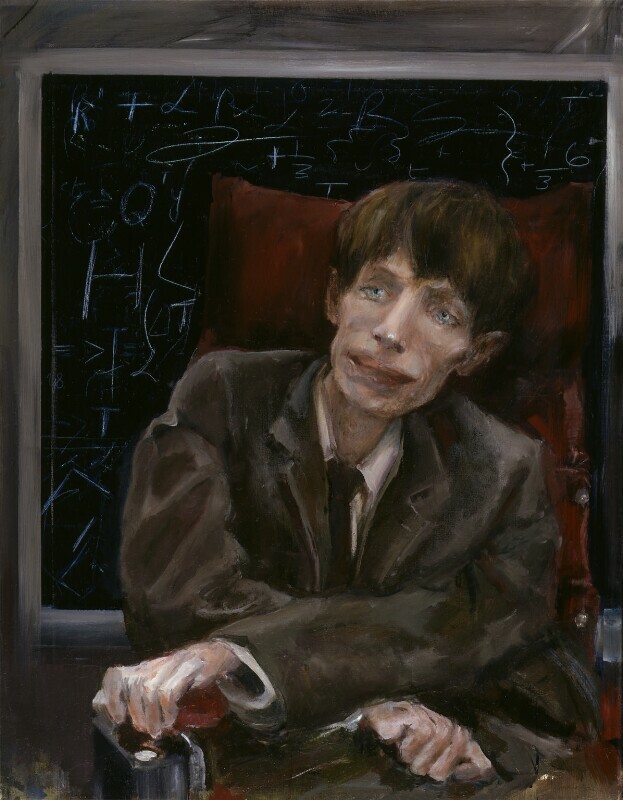 One of the first such commissions was of Stephen Hawking, who at the time was known only to specialists for his distinguished work on relativity. It was only in 1988 that Hawking became universally known as the author of A Brief History of Time. 55 people die in the Manchester air disaster when a British Airtours Boeing 737 bursts into flames after an aborted takeoff at Manchester International Airport. Bob Geldof and Midge Ure organise Live Aid, a rock concert in London and Philadelphia, to raise funds for famine relief. The biggest names in popular music, including Paul McCartney, Queen, Status Quo, The Police, Mick Jagger, David Bowie, U2, The Who, and Led Zeppelin, performed to a TV audience of 1.5 billion. The British Antarctic Survey discovers a hole in the ozone layer above Antarctica. Reformer Mikhail Gorbachev comes to power as first secretary of the Soviet Communist party. He calls for 'glasnost' (openness) in Soviet life, and pursues a policy of 'perestroika' (reconstruction). French intelligence operatives sabotage Rainbow Warrior, the Greenpeace vessel. The ship was leading a protest against French nuclear testing in New Zealand when it was bombed and sunk, killing one of the twelve on board.